Frankensteinia: The Frankenstein Blog: Found! Frankenstein inscribed by Mary Shelley to Lord Byron! Found! Frankenstein inscribed by Mary Shelley to Lord Byron! A true treasure has come to light: A rare, first edition copy of Mary Shelley’s Frankenstein; or, the Modern Prometheus, inscribed “To Lord Byron from the author”. The book was among the possessions of Baron Jay (1907-1996), a British politician and one time President of the Board of Trade. The discovery was made by the Baron’s grandson, bibliophile Sammy Jay. Although Mary Shelley did not sign her name, her writing has been verified by an expert of the Bodleian Library at the University of Oxford, where Mary’s manuscript pages of Frankenstein are kept. It was Lord Byron who, in the summer of 1816, invited the Shelleys to join him at Villa Diodati on Lake Geneva, and it was Byron who proposed a friendly competition, to come up with ghost stories. Mary’s idea grew into the novel, Frankenstein, and published on New Year’s Day, 1818. The copy at hand is one of only six copies given Mary by her publisher. Inscribed, it was mailed to Byron by Mary’s husband, Percy Bysshe Shelley. Lord Byron once recommended the book to a friend, saying, “Methinks it is a wonderful work of a girl of nineteen — not nineteen indeed — at the time”. First edition copies of Frankenstein are rare and can fetch upwards of $100,000. Until now, only one other signed copy was known to exist, and although this new find is incomplete — originally published as three slim books, here, only the first volume has survived — it was inscribed to and once owned by Lord Byron who, as it were, attended the birth of Frankenstein. Given the remarkable provenance, this unique copy is estimated to be worth over £400,000 (roughly US$635,000). The book will be displayed for one week, beginning September 26, at Peter Harrington’s of Chelsea, London, one of the world’s leading rare book dealers. 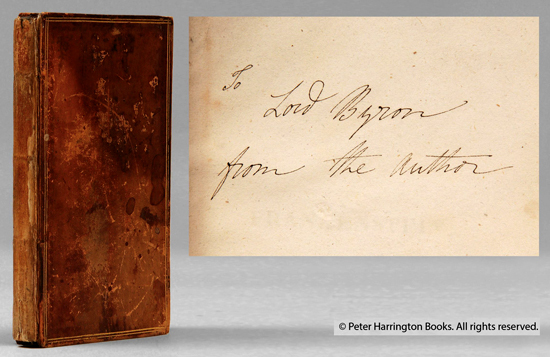 Read more about Lord Byron’s copy of Mary Shelley’s Frankenstein on the Peter Harrington website. I read this and swear I thought I was dreaming. It's like a Romantic fangirl's fantasy come true (even though it really isn't surprising at all). Oh, what I would give to see it in person!